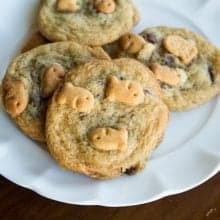 Delicious cookies using Vanilla Cupcake Goldfish Crackers baked right in! After creaming together your butter and sugar, beat in the two eggs and vanilla. Add the dry ingredients all at once and mix slowly but thoroughly. Roll (yes the batter is stick!y!) into golf ball sized cookies and place onto parchment lined cookie sheets. Press down slightly. Press 3 or 4 Goldfish Crackers into the top.